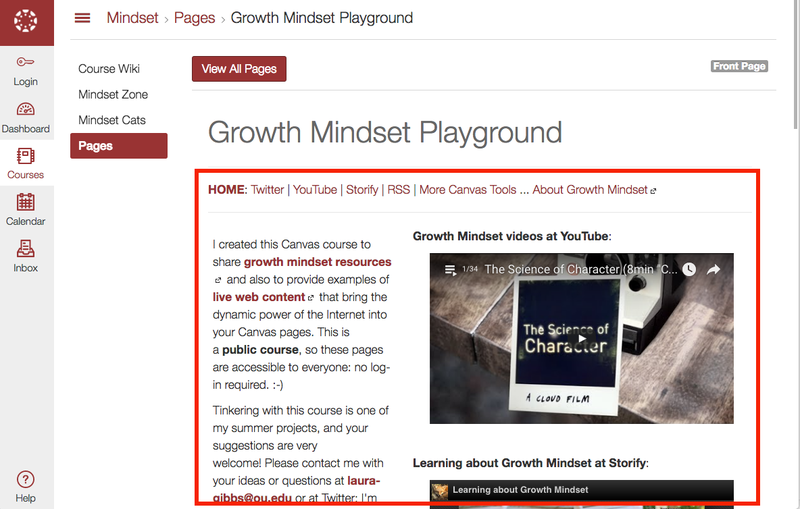 I've been working this summer on a demo course in our new Canvas space, using examples of live content so that I don't edit anything in Canvas; I use real tools on the real Internet — Twitter, Diigo, Pinterest, Flickr, etc. — and the content shows up automatically inside Canvas, as well as on the real Internet where I do my work and interact with people every day. You can see that course at Canvas.MythFolklore.net. But here's the thing: it doesn't really feel like "my" course at all. Below I've listed some of the design frustrations I am feeling as an instructor not able to control the Canvas space to make it feel like my own... and just imagine what it's like for the students: they are even more straitjacketed than the instructors in terms of being able to have any sense of ownership or agency when it comes to the design of the learning space. As you can see, I also have to give up 1/6 of that for a navigation bar that I build manually since Canvas offers no support for content navigation in the wiki. My users can attempt to regain some space by clicking the next-to-the-left browser bar closed, but I cannot count on them doing that... and why would they? It's so annoying: you have to do that for every single page, clicking to close the bar on page after page after page. You cannot pin it closed/open. My guess is that most students just leave it open rather than clicking ... and clicking... and clicking... to close it every time they navigate to a new page. My attempt at a playground is surrounded by concrete, and there seems to be nothing I can do about it. With my Canvas.MythFolklore.net URL (that a redirect URL I created in my own webspace), I can at least bypass the homepage and go straight to a course page (that awful right-hand navigation only shows up on the homepage, thank goodness), but this sad-looking homepage is where my students are going to show up, finding very little of "me" there to greet them. If a person already clicked on the Mindset Cats link, they have already made the choice to visit the URL: so open the damn link... now. You don't have to ask again. And you especially don't have to ask over and over and over again and again every time the same person clicks on that link. Finally, I cannot control the overall look and feel. Don't get me wrong: I'm not a web designer, not at all. I just use themes and templates to configure my web spaces, but I do use themes and templates enthusiastically: how things look really does make a difference to me! 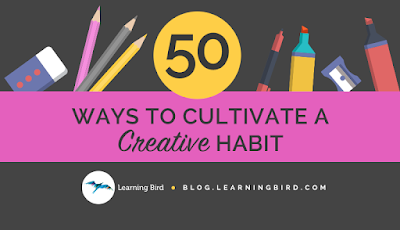 Plus, I know it is not just me: as soon as my students start their class blogs, they start designing them to match their own interests and personalities — choosing different fonts, layouts, background images, widgets. It's wonderful! Even better: they learn from one another as the do that, seeing something that they like at another person's blog, and then figuring out how to do that same thing or something like it at their own blog. 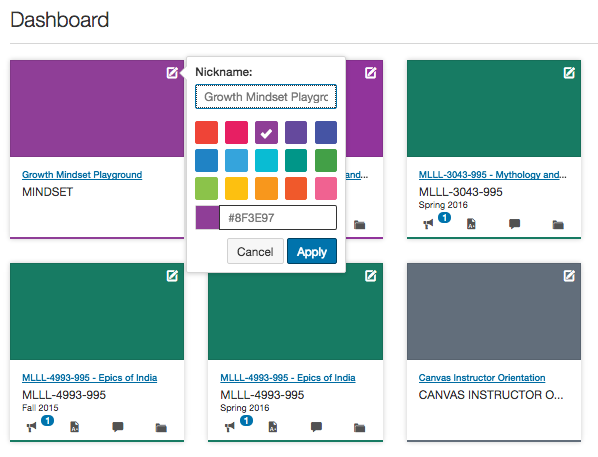 But in Canvas (and in every other LMS I have used), there is no such process going on: everything looks the same. And the system is designed to make everything look the same: it's not a bug... it's a feature. I've tried to add a some kind of distinctive image to my "little box" on the dashboard, but all I can do (apparently?) is pick the color. There's a purple one, and a green one... sing along! Digital diversity. I know people will advance the argument that students want or need things to all look the "same" ... but I don't think that makes sense. Aren't we supposed to be encouraging students to LEARN NEW THINGS...? To develop new digital skills? To appreciate the variety and diversity of the Internet as a space for sharing and interaction? Along with human variety and diversity too (not an unrelated problem, but that's a topic for a separate post...). It's a sad commentary indeed when students can find more variety going from one university food service location to another than they will find as they go from class to class in the LMS. I've been teaching fully online classes since 2002, using very distinctive and unusual web spaces built with a wide variety of tools, and students have never said that that they wished I used the LMS instead. Sure, they have suggestions for how I could do a better job of building the class space (and thanks to their suggestions, the class space gets better and better every year), but not once, ever, has any student ever said in a course evaluation that they would have preferred the standard LMS instead of the shifting configuration of blogs and wikis and social networking spaces that make up my class. Of course, no post is complete without a cat! And even though I am now using this #elemess hashtag just for fun (thanks to George Station), my point here is a serious one — really! 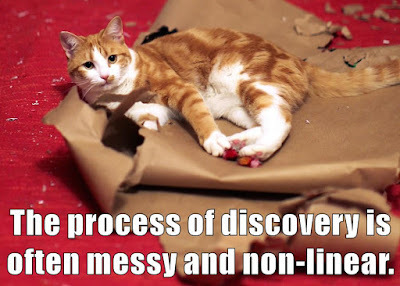 Just take a minute to read the article that inspired this particular cat: How to Spark Curiosity in Children Through Embracing Uncertainty by Linda Flanagan. is often messy and non-linear. So, I say: bring on the mess in the LMS! Or, even better, go wild with OUCreate (our Domain of One's Own installation) where the spaces that OU faculty and staff and students can create for themselves will look wonderfully different from one another. 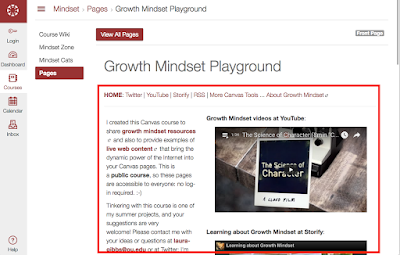 I just hope that faculty will spend as little time investing in Canvas as possible... and as much time as they can spare in exploring the possibilities that OUCreate (and other online playgrounds) can offer, while encouraging their students to do the same. Previous Storify collections since the LMS discussion began! I am really impressed by the openness and honesty of this statement by Maha Bali and Jim Groom: Does EdTech have an ethos? And why should I care? 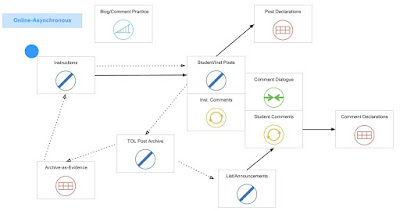 Yes, universities use LMSes, but that does not mean the LMS is a good thing, and we need to ask hard questions about the LMS is for and how/why we are using it. I agree very much with the characterization that Maha and Jim make here: "The LMS delivers on its name: It is a closed, copyright haven that makes giving quizzes and grading easier. How does that measure up in terms of ethos? It reinforces higher ed’s refusal to push back on draconian copyright laws, their intransigent fear of openly sharing, and the continued quest for efficiency around the management tasks of teaching. All of this can make sense in some contexts, but as an ethos for a rich, web-based teaching and learning experience it tends to fall short." Right now, we are in the process of switching to a new LMS at my school, and I was hoping (am still hoping...) that in addition to all the training (and training and more training) that we have going on, there will also be some discussion of WHY. Discussions about TEACHING and LEARNING. Discussions about alternatives to the LMS that will allow faculty and students to do things that are simply not possible in the highly restricted space of the LMS. Instead of letting the LMS features list dictate our menu, we should be developing our own goals and only then looking to see if the LMS does, or does not, provide support for those goals. One useful way to prompt discussion might be for people to share a list of some online articles and/or videos about teaching and learning. If we all share the ideas that challenge and inspire us, we could make available a great set of questions and ideas for people to have in mind before they plunge into the "click-this, click-that" world of the LMS. I'll share this with the #BeforeYouLMS at Twitter... maybe others will join in! I'll retweet and curate with Storify if other people want to contribute resources to expand the learning horizons. Update: I've started a Diigo collection: #BeforeYouLMS. Cheating Lessons, an interview with James Lang. As a summer project, I am going to be re-reading Devdutt Pattanaik's Business Sutra in order to create some reading guides for my students (I'll be posting those notes at the Reading Guides site for my Indian Epics class), but also to take some notes for myself about the ways in which Pattanaik's book applies to education. Over the past few years, I've been finding so much useful information from the business world (Harvard Business Review is great, for example), and this book is a perfect example I think of how something written with business in mind has so much to offer the world of education! So, these are my education notes for the Week 1 - Reading A portion of the book! See also the notes I made for my students: Reading Guide. That Reading Guide post is where I provide links for the Sanskrit terms and Indian context. What I will be doing here is excerpting quotes and passages that I think are most relevant to the topic of education. Want to join in? More about the book here: Business Sutra Overview. I'm tweeting links to my posts with #SummerBizSutra. The book opens with this wild drawing by Pattanaik that lists many of the binaries he will be working with in this book. 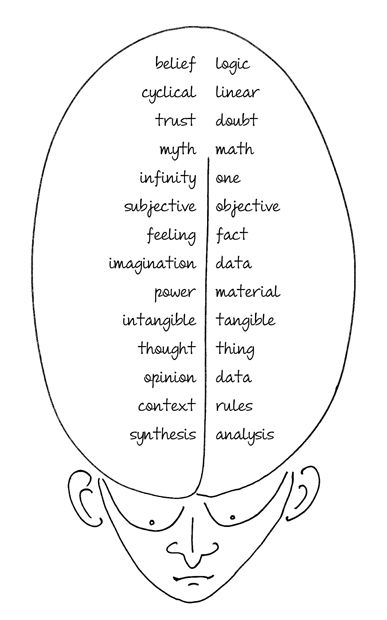 Binaries are sometimes useful for understanding a situation, and sometimes not (to be binary about it, ha ha), and this chart of binaries captures a lot of what I value in education: the kind of teaching I want to do is very much on the belief... trust... infinity... imagination side of the chart, and I despair about education that is going in the opposite direction (the Siren song of Big Data). The idea of BELIEF is central to the book (and so it appears at the top of the list), and one of the problems DP sees in the business world is the gap between belief and behavior... which is a huge problem in schooling too! "Respect (intangible belief ) may manifest in politeness (tangible behaviour), but politeness may not always reflect respect." 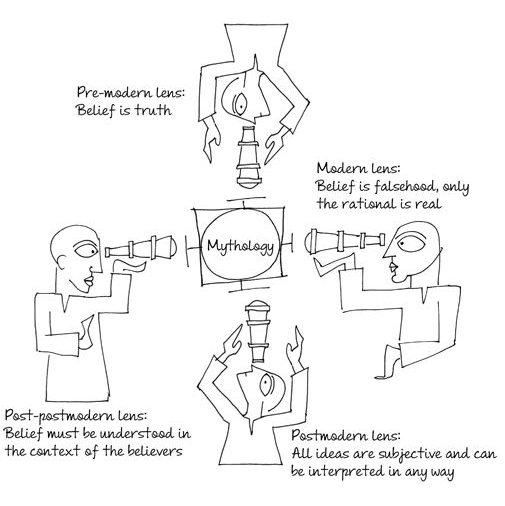 Modern lens: Belief is falsehood; only the rational is real. 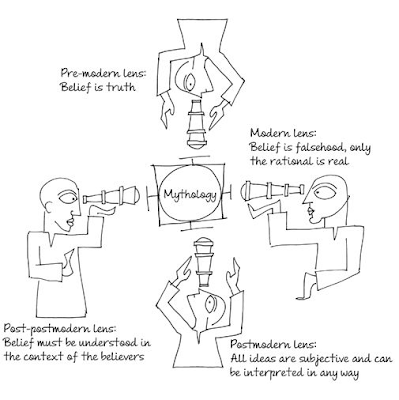 Postmodern lens: All ideas are subjective and can be interpreted in any way. Post-postmodern lens: Belief must be understood in the context of the believers. The conflicting truths and truth-claims of the business world are also a source of huge conflict in education (and for "compensation" here, just substitute "grades"): "Modern management systems were more focused on an objective institutional truth, or the owner’s truth, rather than individual truths. People were seen as resources, to be managed through compensation and motivation. [...] But humans cannot be treated as mere instruments. They imagine. They have beliefs that demand acknowledgment. They imagine themselves as heroes, villains and martyrs. They yearn for power and identity. Their needs will not go away simply by being dismissed as irrational, unscientific or unnecessary." Specifically, that dismissal takes the form of behavior modification... which is just as prevalent in schooling as in business management: "Since changing beliefs is difficult, perhaps even impossible, the attention shifts to behavioural modification through rationality, righteousness, rules, reward and reproach. [...] Great value is given to ‘habits’, which is essentially conditioning and a lack of mindfulness." DP contends that this type of behavior modification is actually in conflict with some fundamental dimensions of Indian culture: "The Indian economic, political and education systems are also rooted in Western beliefs, but Indians themselves are not." And here is how DP characterizes the diversity of Indian culture with its plurality of its beliefs, and for more about diversity in Indian culture, see DP's TED talk - India is Not Chaotic (embedded below): "The notion of conversion is alien to Indian faiths. Greater value is given to changing oneself, than the world. Belief in India is not something you have; it is what makes you who you are. It shapes your personality. Different people have different personalities because they believe in different things. Every belief, every personality is valid. Energy has to be invested in accommodating people rather than judging their beliefs. That is why there is so much diversity. We may not want to change our beliefs, but we can always expand our mind to accommodate other people’s beliefs. Doing so, not only benefits the other, it benefits us too, for it makes us wiser, reveals the patterns of the universe. [...] Such ideas thrive in beliefs rooted in many lives, and religions that value many gods." Rob's challenge was about "office hours," but that is too instructor-centric for me; what I've designed instead is a new option I really want to use in class next semester to see how it goes: Thinking Out Loud. I will report back in August when I get the assignment actually set up for my classes! This would be a blog post, something like the Famous Last Words option that people now do, but the difference is that instead of being a reflective post, it would be questioning post, where students bring a real problem to the table that needs brainstorming with input from others: it could be something related to the regular reading/writing assignments for class, something related to their class project, a tech problem, or a more "meta" problem about school/life problem in which the class is involved only tangentially. I would love it if students used this as a way to point out weaknesses in the class and proposed solutions! I will commit to responding to those posts (with a back-and-forth dialogue in the post comments), and because the dialogue is taking place in the blogs, other students might chime in as well. This commitment from me is what makes it different from other blog post assignments; in my classes, the blog space really belongs to the students while I only chime in occasionally — but this TOL (Thinking Out Loud) post will have the distinctive quality that I will also be part of the process: I will respond to all posts, and I will be writing them too, asking the students to help me with problems I am trying to work on as I continuously (re)design the classes. Information: Instructions. There will be blog post assignment instructions, and this type of post will be included in the weekly orientation at the beginning of the semester, with hypothetical examples of how it could be used. Method: Course information wiki page. Practice. This activity does not have dedicated practice assignment, although students are doing blog posts and blog comments, and also working with images in blog posts, every week. Information: Archive. 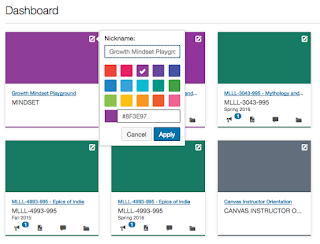 There will be an archive of "Thinking Out Loud" blog posts for students to consult (during first semester this will be evolving; in future semesters, the archive of past posts will be available already); hopefully the archive of posts will inspire them to write their own TOL posts. Method: Blog post archive maintained in Inoreader; perhaps also Diigo (for better searching, tagging). Information: Blog Posts. The students writes a blog post describing the problem along with various solutions, with advantages and disadvantages for the solutions. I will also use this as a way to share my thinking about the class with students, writing my own TOL blog posts to request their help in finding good solutions to problem I am trying to solve with the class. 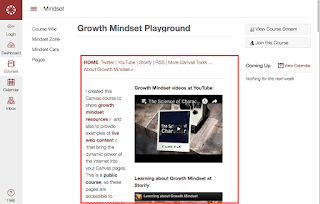 Method: Blog post following the usual format for class: a label to identify it in the blog navigation, plus an illustrative image, and keyword in title for Inoreader tagging. Feedback: Instructor. 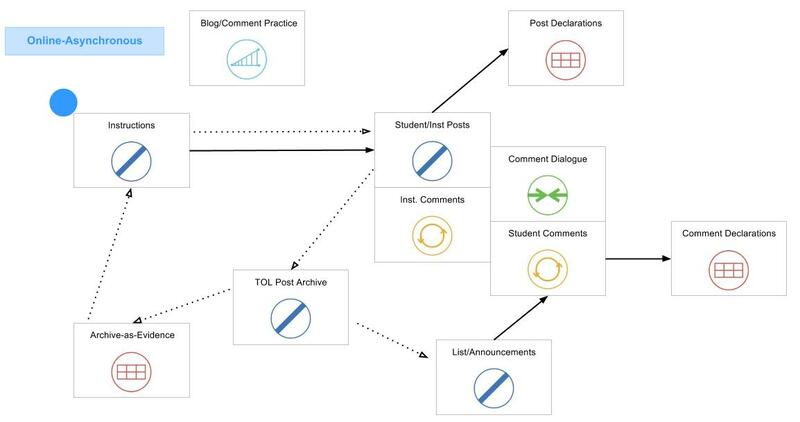 I will respond to every TOL post (that is the "Office Hours" component); normally I do not respond to student blog posts, but this assignment is different: I will respond to every TOL post. Method: I will use Inoreader tags to track every TOL post to make sure I reply, and activate email notifications so that I will see every comment on each TOL post. Information: Active TOL posts. I will provide various channels for students to be aware of active TOL posts that could use comments. Method: I will mention TOL posts in the class announcements when they are of general interest, and I will highlight TOL posts in the free-choice blog commenting assignment that students do each week. Feedback: Other Students. Other students may also comment. Method: Students would see a TOL blog post as they visit other students' blogs, and I will highlight posts of general interest in class announcements also. Dialogue. There is an ongoing opportunity for interaction between the posting student, other students, and the instructor. 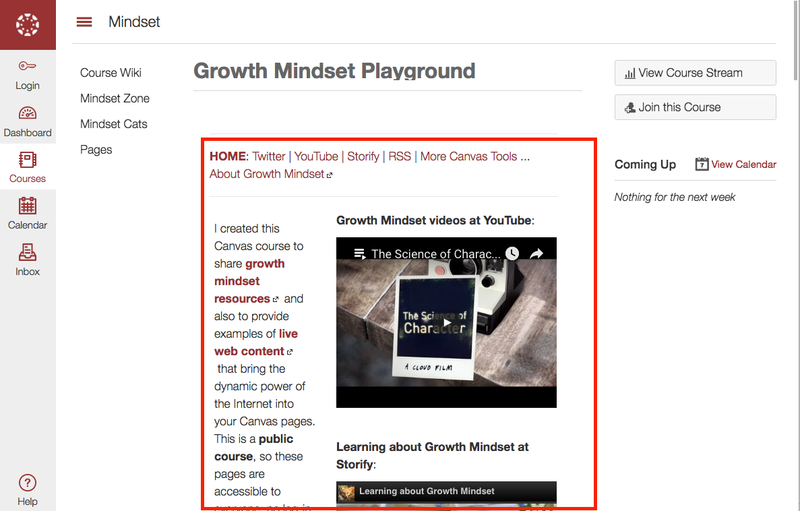 Method: Blog post comments, with email alerts option. Evidence for Comment Completion. As usual, students will write their comment as part of a commenting assignment, checking for completion. Archive as Evidence for Activity Success. I will see the TOL Post Archive growing (or not... if this is a dud first time around, as sometimes happens), and I will revise the activity based on what I learn from the evolving archive. Method: I will be relying on the automatically generated Inoreader archive of TOL posts, and after that archive grows, I might build a Diigo archive, tagging the posts and providing additional tags for searching/sorting.